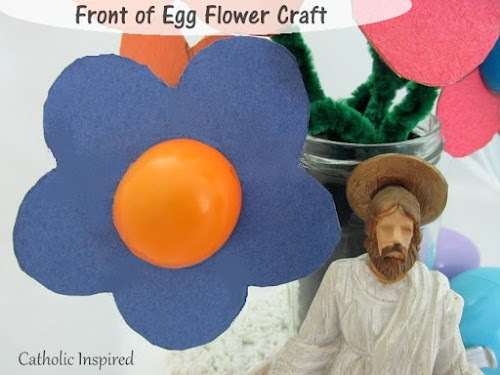 Home » Easter » Little Flowers Girls Club » Our Lady with Flowers » Spring Crafts » Easter Egg Flower Craft! Upcycle Old Plastic Eggs! 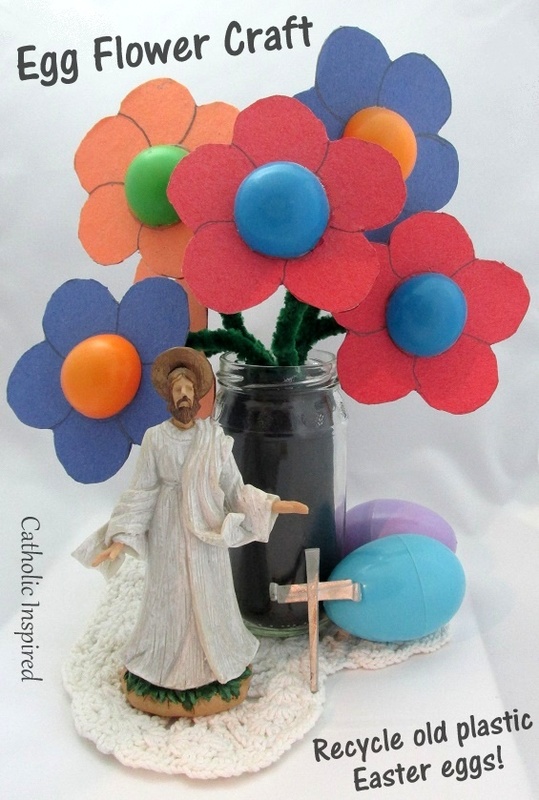 Easter Egg Flower Craft! Upcycle Old Plastic Eggs! My oldest son, Jacob created an adorable bouquet of flowers for me! These flowers are made from plastic Easter eggs. The eggs give this colorful bunch of flowers a cute pop! 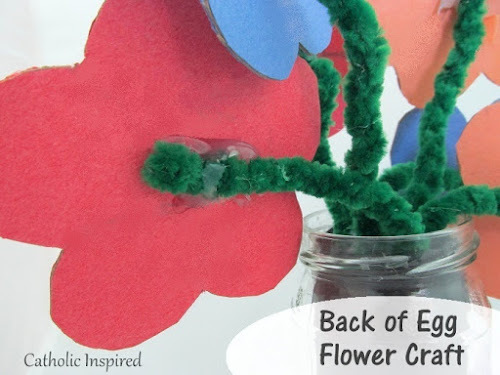 Use a pencil and half-eggs to create a symmetrical flower shape on the colored construction paper. With a glue stick, glue the colored paper flower onto the stiff cardboard. Glue another sheet of the same color to the back of the cardboard - sandwiching the cardboard between the colored paper. Hot glue the egg-bottom to the center of the flower. Add hot glue only to the inside edge of the egg. Twist 3 or 4 green pipe cleaners (chenille) together to make a strong stem. Hot glue one end of the pipe cleaner stem to the back-center of the flower. That's it! Now make a few more to create a bouquet! Front of egg flower craft. Back of egg flower craft project. This activity is a great way to recycle old plastic Easter eggs! The kids can make these crafts for Mother's Day or for Our Lady! Like this? 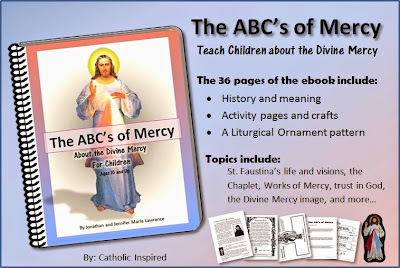 You also might like our Divine Mercy eBook! 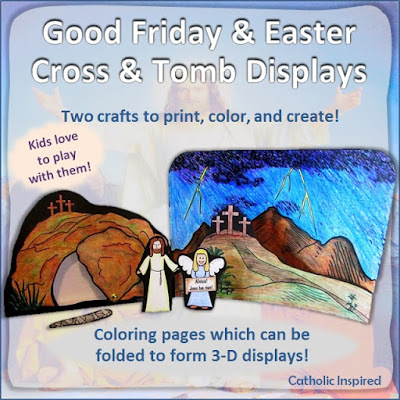 Or our Easter Display Crafts! 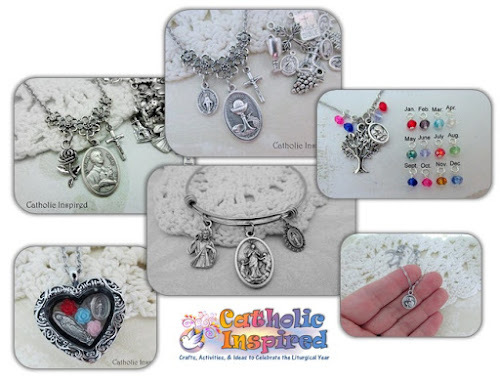 Looking for a First Communion gift, Confirmation gift, or Mother's Day gift? thx for sharing and for the tutorial ! Jen, I used your Risen Jesus printable again this year!!!! thought of you and your family as I out together your creative Easter dessert this Sunday!